Neither museum lets you take photographs inside. So, there went my plans for today’s minute. Luckily there are what feels like a bajillion women and young girls milling about Cusco asking if you want to buy something, or get your picture taken with them. Andrew and I were sitting in the Plaza of San Blas soaking up the sun after Español, when this woman decided to join us. She tied her portable loom (not womb, like I almost say in the video) to our bench, sat down, and went to work weaving a new belt. She had a bag full of them she was trying to sell. We humored her, watched for a little while, and gave her a little tip before we left for La Casa Concha, or more informally; The Machu Picchu Museum. 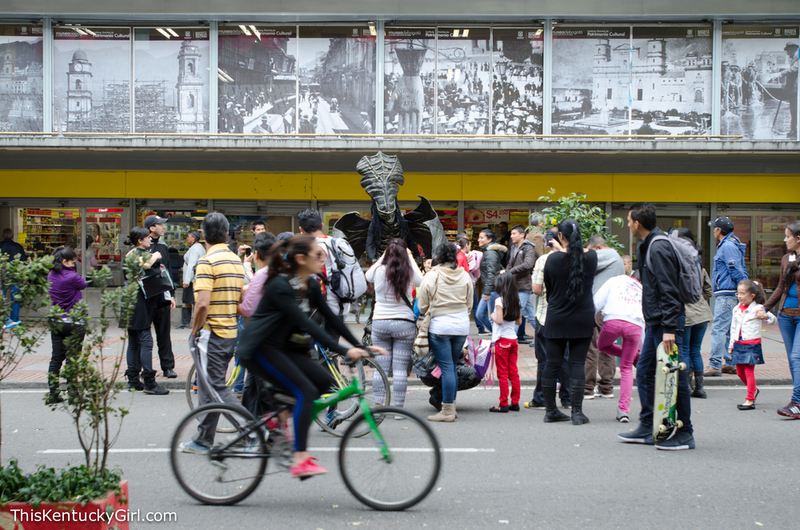 We actually went to La Casa Concha and the Inca Museum on two different afternoons. 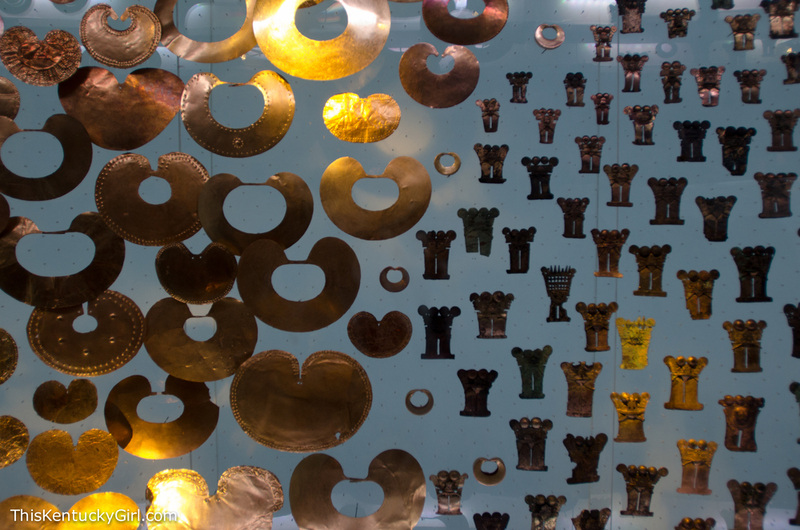 We heard the Inca Museum wasn’t great, so we decided to check out La Casa Concha first, mostly after reading this Peru Travel post about the museum dedicated to Machu Picchu raving about how much better it was than most museums in Peru. It has a more modern feel to it, thanks to the life-like dioramas, videos, and English descriptions. However, despite having ten exhibition rooms, the rooms are often bare and while the museum suggests two hours for your visit, I think Andrew and I were in and out in an hour tops. It was nice, but I cannot stress enough how bare we thought it was and definitely not worth the entry fee. Another afternoon, we decided we may as well check out the Inca Museum. When in Cusco… This museum was much bigger, had a lot more to offer than ten half-filled exhibition rooms… but it’s in desperate need of some updating. I wish these two museums had combined forces to make one really great museum. Neither is better than the other… they are just different. La Casa Concha is more modern however, offers less. 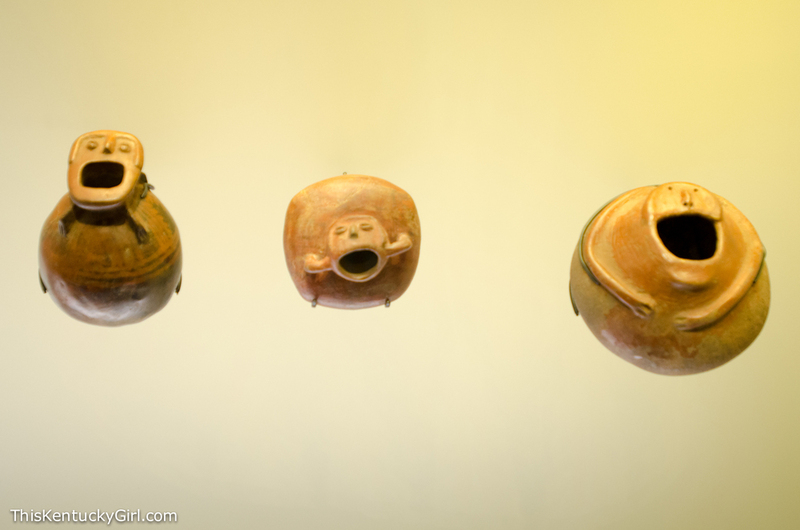 The Inca Museum is quite large and has a LOT to offer, but it’s poorly organized, poorly displayed, and at times even dusty! It kinda felt like a school science fair with an Inca theme. Some displays were great, you could tell the smartest kid put forth some effort… But others weren’t so great and I felt sorry that such an interesting culture was being displayed so poorly. I almost wished I would have spent my money on a really great Inca and Machu Picchu book instead of entry to the two museums. If only I had spare room in my bag! At least our dinner more than made up for the lackluster museum visits this week. Yep, in case you can’t tell, that’s not Peruvian you’re looking down on… Andrew found a Korean restaurant for us to try! And it was spectacular. By far the best Korean food we’ve had on this trip. If you’re in Cusco, you have to take a night off of eating ceviche (I know, it’s a hard thing to do) and try Sa Rang Che Restaurant. 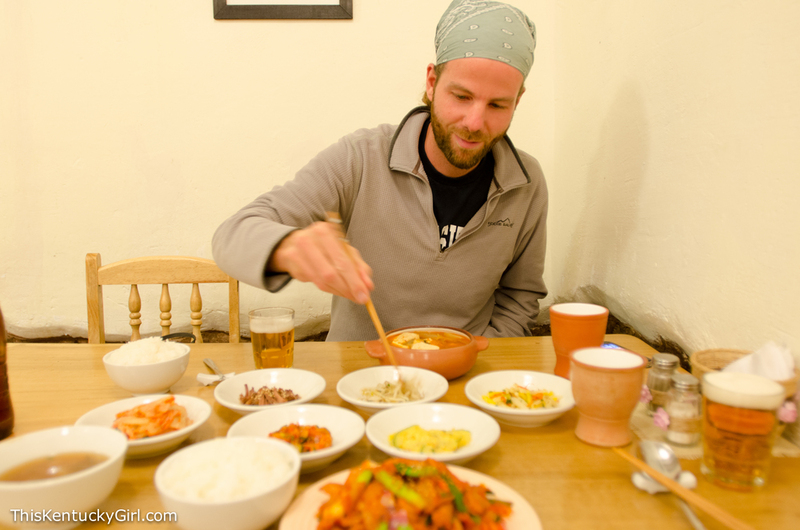 My mouth was blissfully burning just like it would in Seoul. Before we left, the owner came out to talk to us about a problem with the credit card machine. She was Korean, speaking to us in Spanish. We in turn, told her we understood, and wished her a Happy Chuseok, in Korean. Then there was a flurry of Spanish, Korean, and even a little bit of English. We walked out, and Andrew and I exchanged a look that somehow summed up how incredibly strange it was to be in Peru, speaking Spanish and Korean simultaneously. Momma’s last full day in Peru! We’ve been moving so fast through Peru, that we were content with wandering around the city of Cusco and seeing what we could find. We hadn’t heard very good things about the Inca Museum(s) so instead we headed towards one of the higher rated museums first, The Center for Traditional Textiles, walking past Quirikancha, once the most important temple in the Incan Empire, and then through the many squares of Cusco, ending up at the Chocolate Museum. 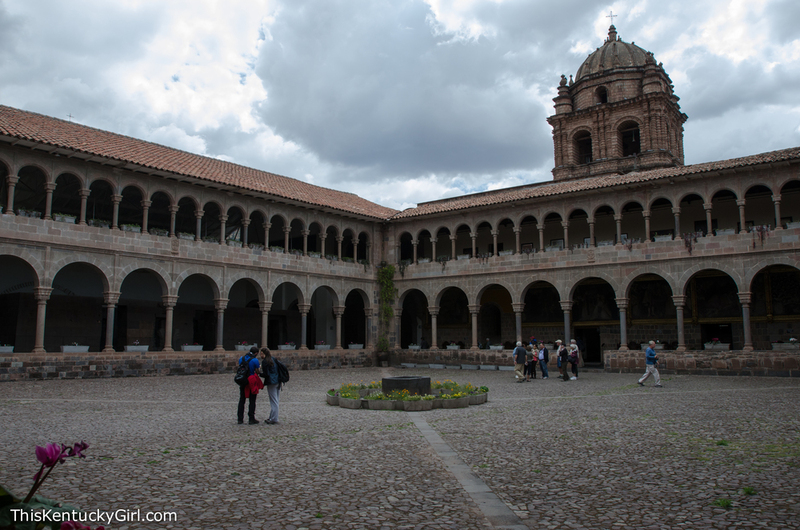 Quirikancha was once the most important temple and the center of the Inca Empire. 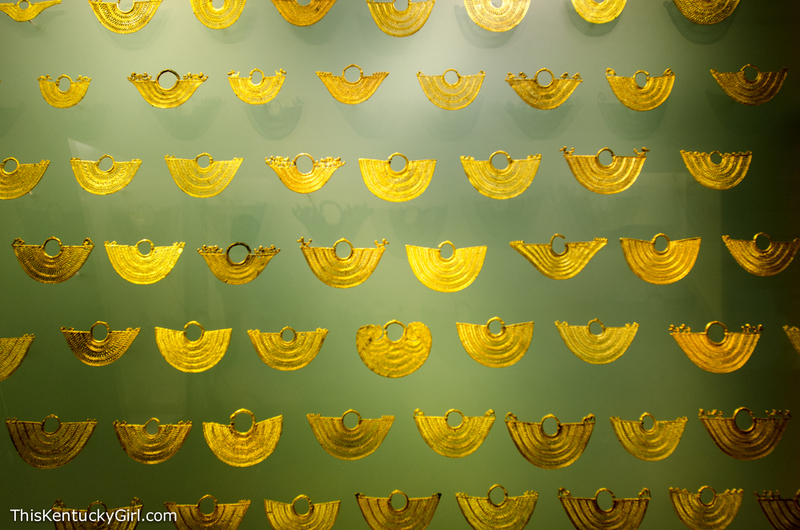 Once upon a time it was covered in gold, as it was dedicated to the Sun God, Inti. That is, until the Spanish came along and demanded a ransom in place of the Inca Atahualpa, and the temple was stripped of all of its gold. Juan Pizarro, one of Francisco Pizarro’s brothers received Quirikancha and before he died, donated it to the Dominican Order of priests. Eventually, the church that you see behind (or rather, inside the walls of the former Temple of the Sun) the Incan foundation was built. 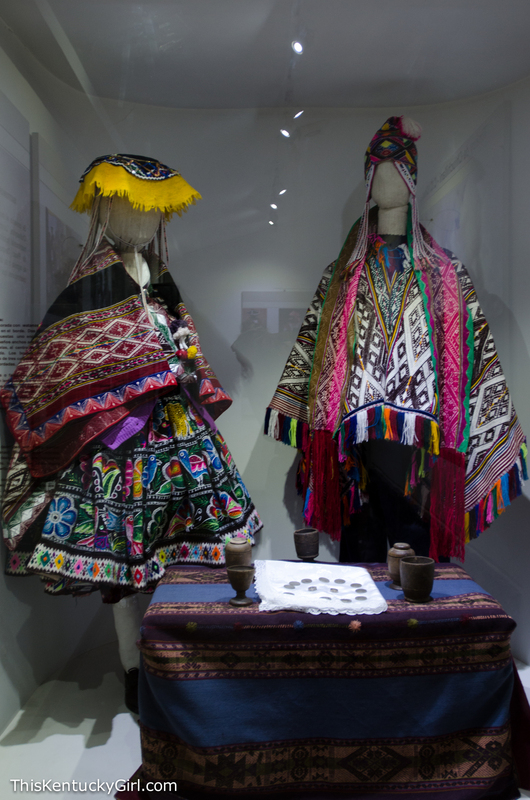 However, our first stop of the day was the Center for Traditional Textiles, a free museum with rather beautiful displays of the intricate weaving that is so common throughout Peru. 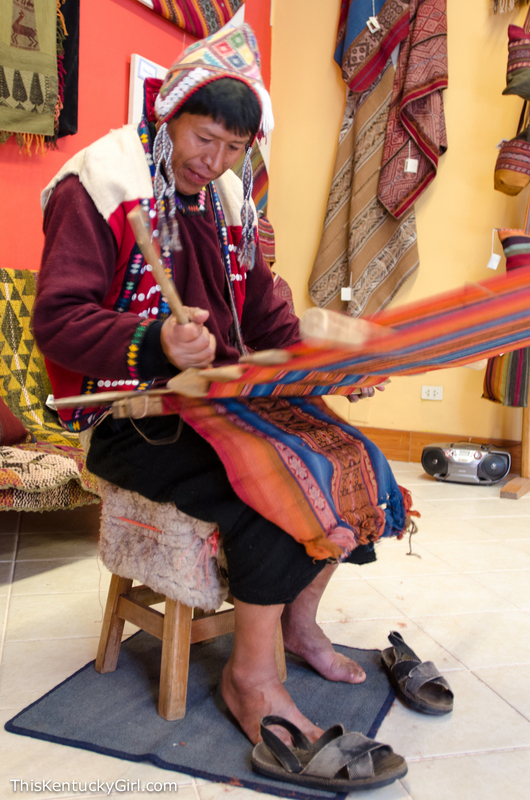 I was a little hesitant, but Andrew assured us that it was one of the highest rated museums in Cusco… and Mom had just finished her first course in weaving, so we pretty much had to go. My favorite part of the museum were the live demonstrations and the half finished weavings that were tied off. After our visit, I noticed that these half woven pieces used as wall hangings instead of scarves or blankets or even wraps were quite popular around Cusco. Again, if I knew exactly how many walls I was returning to, I would have bought them all up! I thought they made such beautiful art pieces, especially knowing that they were preserving a traditional culture that is being quickly replaced by low cost imported string and machinery. 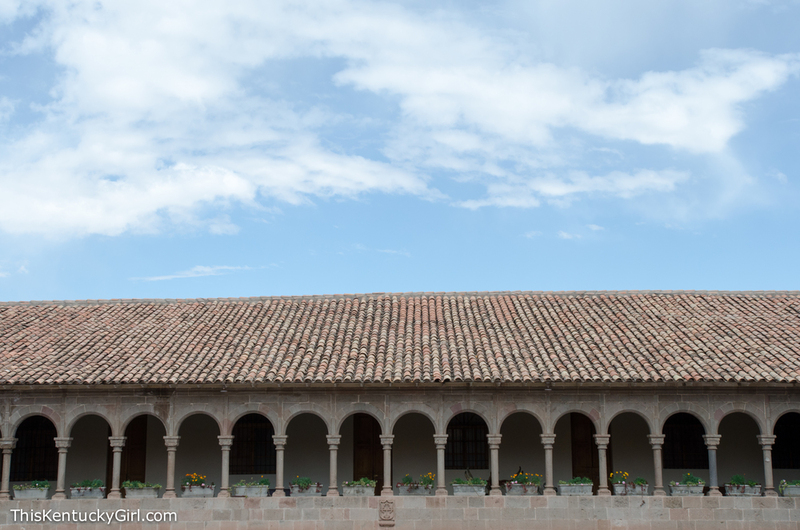 The Center for Traditional Textiles is right down the street from Quirikancha, and the Convent of Santo Domingo. What’s somewhat unbelievable is that the Incan walls were kept entirely intact and the church was built in between the walls of the Incan temple. Above you can see the courtyard, but throughout the building were different Incan rooms that were still free standing with dirt floors and nothing inside. 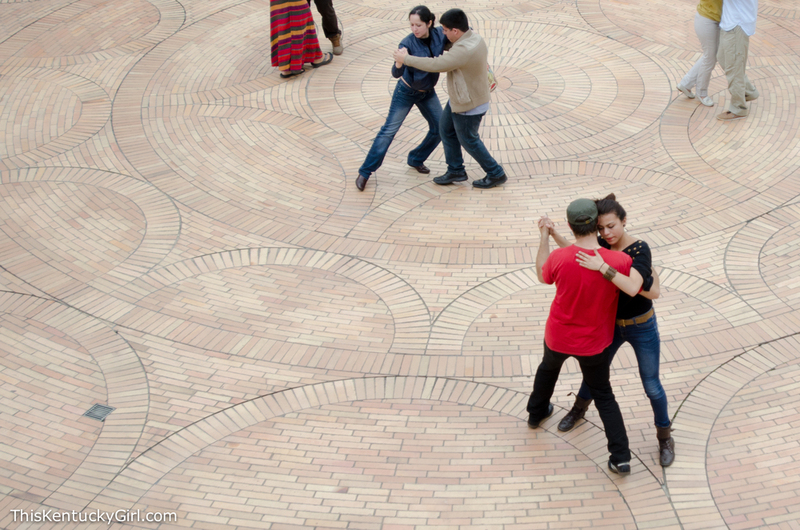 Technically we weren’t supposed to take pictures, but I saw many people freely taking photographs out in the courtyard. I’m not sure why there was a no photo rule- maybe for the interior rooms that held loads and loads of religious art? Either way, it was interesting to walk through, but it made me feel a little uncomfortable wondering how the Incans must have felt back in the day when their most important temple was handed over to an entirely different religion, one that built a gigantic church and monastery around walls that once used to be covered in gold. The above picture was to show how Quirikancha was at the center of the Incan universe. How other temples in the empire all led to Quirikancha. The picture below illustrates how the Incas looked at the stars. While we look at the stars, and the constellations by connecting the stars together, the Incans looked at the pictures made in the dark spots or shadows in between the stars. Outside of not only Quirikancha, but throughout the streets of Cusco, women in traditional dress walked around tethered to a grown llama or holding a baby lamb. Often, they would put the lamb in your arms, encouraging you to take a photo, for which you would have to pay for after. I didn’t need a photo of myself with a baby lamb, so I would always get really excited and pet the lamb (simultaneously empathizing for it) until they would realize I wasn’t going to pose for a picture with it. After The Choco Museo (which was an informative, albeit glorified shop) we wandered around, fed the birds, and coerced Mom into one last drink before her last day began in the morning. 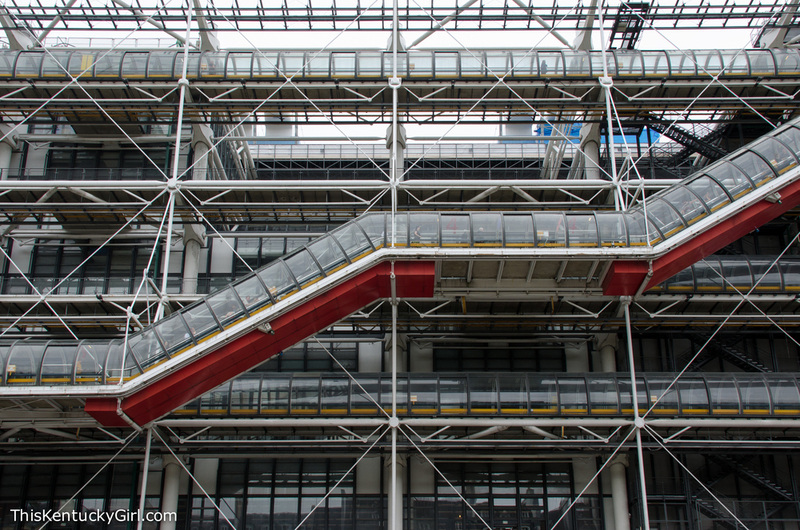 We weren’t supposed to go to the Centre Pompidou today, but it started raining, and we weren’t up to doing a walking tour without an umbrella… So we switched gears and headed to the Centre Pompidou for some contemporary art (a bit of a change from the Louvre yesterday) and then went to check out Le Marais! We went to bum around Le Marais on our own before joining up with another free walking tour (giving Discover Walks Paris a second chance). Let me just say that I’m glad we went on our own beforehand, because again, I was a bit disappointed with our guide, but in the end I was glad to have seen another part of the city that was new to me! I’m already a little bit anxious to explore it some more during our next visit! Centre Pompidou is a bit of a stain on the Parisian cityscape. It’s a contemporary art museum that was built inside out. I like it. As much as I love how ‘stuck in time’ Paris is, I find this building a nice little reminder of today! I also like the whimsical Stravinsky Fountain and of course, the giant street art (portrait) overlooking the entire complex. Really, what’s not to love?! We headed downstairs to the permanent collection. We wandered in and out of rooms, sometimes together sometimes separate. I was standing in front of one piece trying to figure it out, when a very nice Sudanese man approached and asked me what I thought of the piece- in French. I was a little surprised, but quickly rebounded thinking how fun it would be to practice my buried language skills. I responded, in French that it wasn’t for me. It really wasn’t. It was a mixed media (wood mostly) piece that didn’t leave much to the imagination. Or maybe it left too much to the imagination and I didn’t have enough of it? Either way, his eyes grew wide and he though I was talking about the museum in its entirety. I quickly reassured him I was only talking about the one piece, and then the small talk began. I wandered into another room. He followed. He kept asking questions, I kept answering trying to ignore the little voice in my head that reminded me how stupid I sounded en Français. And then he asked me to sit down with him. And it dawned on me that he wasn’t simply chatting to practice speaking French. Andrew was nowhere to be found. He never is, by the way, when I find myself in a position similar to this one. “Oh… So sorry, I should probably find my boyfriend…” I responded. To which he responded asking why I had lost him in the first place. Then I got flustered and I think I might have said something along the lines of “Oh it’s ok to lose him” giving the wrong impression entirely. Andrew, of course was entirely amused by the story later, especially when I refused to be left alone in a room full of contemporary art. Maybe the Centre Pompidou isn’t the prettiest building in Paris, but it still has one of the best views of the city from it’s roof and balconies. Hungry, and nostalgic for our time in the middle east, we headed over to Le Marais to try some of the infamous falafel. I know, not exactly what you would expect to find in the middle of Paris, but maybe that’s only if you weren’t familiar (like myself) with the Jewish influence within the fashion district. En route, we passed this empty laundromat. For some reason (maybe it’s because my Grandmother owned a laundromat once upon a time?) I couldn’t resist taking a picture. We ate on the street, interrupted only by Andrew freaking out over some pigeon poo running down his back. I couldn’t stop laughing. Had my hands not been full of falafel, I would have filmed it for sure. Instead, he yelled at me to stop laughing and help him clean it up- because obviously, as it was on his back, he couldn’t see it. Stuffed, we walked around, sat down on some church steps and waited for our walking tour to begin. I was excited to learn more about the fashion industry, as the ‘free walking tour’ website advertised, but it seems as though our guide had other ‘fun facts’ in mind instead. We learned a good deal about the history of the neighborhood, we learned even more about her time going to a high-school in the same neighborhood, but not so much about the fashion industry or influence over Le Marais. I was disappointed. She was sweet, but it wasn’t a great tour, and I fully plan on returning next time to soak up more of this neighborhood and even maybe splurging on a not so ‘free’ walking tour? Just don’t do it. 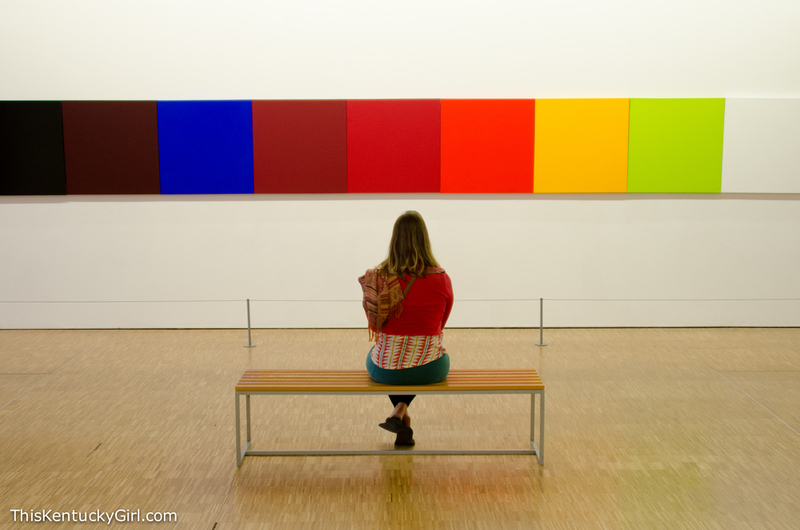 I know you’ll be tempted… Museu Picasso on a Sunday is free after three! But unless you get there at noon, to stand in line for three hours to get in for free at three, then you’re better off just going another day… Because chances are the line will be long and you won’t even have enough time to stand in it allowing you enough time to actually see the museum once you get inside. It’s bananas. B-A-N-A-N-A-S. Our plans foiled, we did what we do best: wandered around town, searching for street art, ducking into churches, people watching, and in general soaking up the city du jour. Our day didn’t start off the smoothest. Perhaps I should backtrack to us finding out a few nights prior that we couldn’t stay in the same place and had to frantically find another place at the last minute. Europe in August (aside from our wonderful few days in Burgundy) was proving to be difficult. Couchsurfers were either fully booked or out of town. Hostels were expensive. 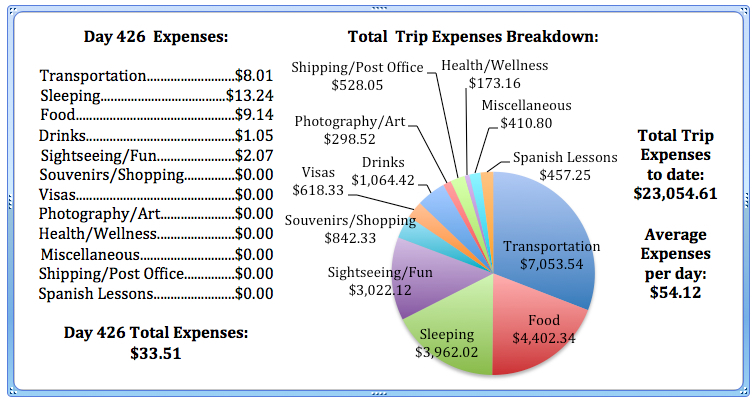 Hotels were even more expensive and/or full. It was stressful to say the least. We finally managed to find a place on Air BnB (not our favorite site) had to pack up our things, move across town, and were very warily welcomed into the house of a stereotypical Frenchman (i.e. the complete opposite of all of my lovely, welcoming, warm French friends) and his overly sweet Columbian girlfriend. 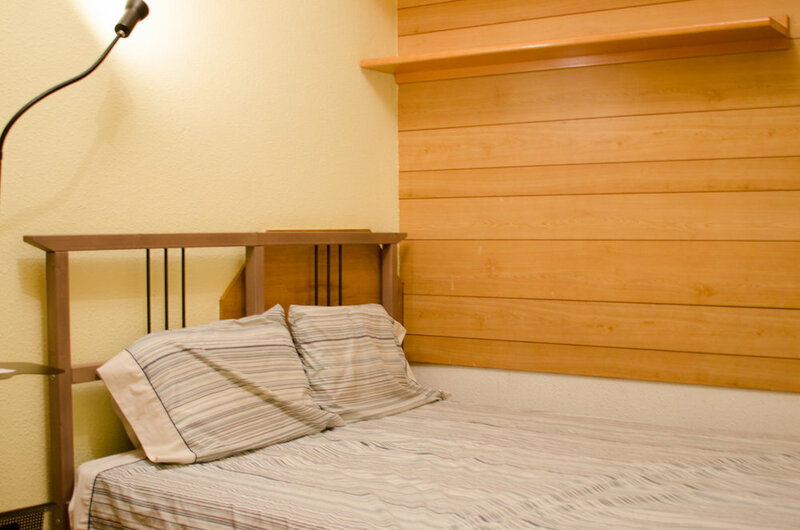 It was strange, and even though we looked forward to exploring the city, we didn’t exactly look forward to returning to our rented room at night… It’s a great thing Barcelona is such a wonderful city to get lost in! I don’t know what it is about light fixtures and this trip, but for some reason I keep finding myself drawn to them! I saw this one in the window of a restaurant and thought it was so clever! Note to self: I want to figure out how to make this for my future kitchen! 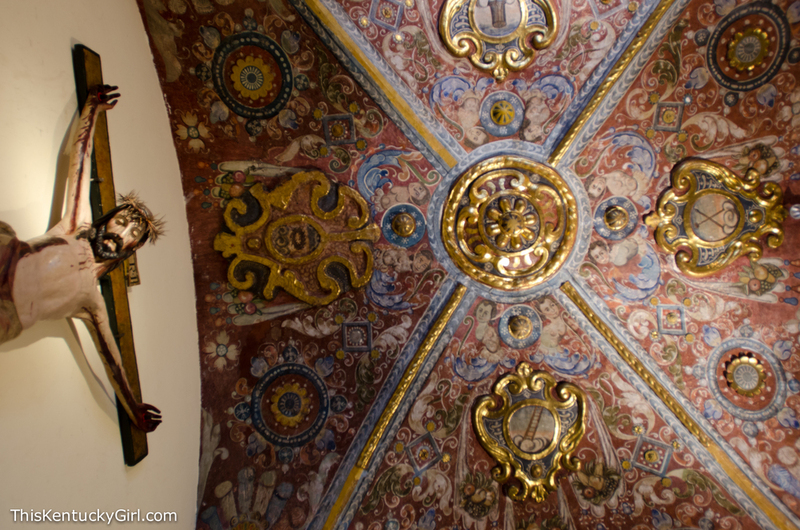 We snuck inside Santa Maria del Mar thinking it would be calm, cool, and quiet. It wasn’t exactly cool nor quiet, but it was beautiful and the stained glass was impressive. Despite the heat, Andrew and I sat inside for awhile taking the architecture in. Party in the street! Now, where are all of the people? I couldn’t get enough of this festive street! We then remembered the Museum of History was free today as well, so we thought we’d give it a shot, knowing we might walk away from it just like we did at the Picasso Museum. I guess not as many people are interested in history as they are in Picasso because there was no line and we were able to walk around freely! Unfortunately, the museum offered few descriptions in English- most were in both Spanish and Catalan and we were at a bit of a loss looking at some of the exhibits. It surrounded (and was under) Placa del Rei, so it made for a nice entry and exit past the same steps I mentioned during our Old City walking tour. We walked around town some more, heading towards a restaurant for an early (by Barcelona standards) dinner. I’m not sure what this sign means in English, but thought it was pretty regardless if I understood it’s meaning or not.